Over the past three years, BSR’s Women in Factories China Program has delivered more than a million hours of training to nearly 90,000 workers in more than 45 factories across seven different industries in China’s manufacturing supply chain—significantly exceeding program goals and helping empower women as agents of sustainable change. The Women in Factories program—funded by and in partnership with the Walmart Foundation's Women’s Economic Empowerment Initiative—was designed to build the capability of human resources departments to provide work and life skills for workers, while demonstrating the value of investing in women workers who can become the next generation of leaders. Surveys of participants show that the program has given women workers the skills and knowledge they need to change their lives and how they work, creating value for factories and catalyzing change in manufacturing supply chains. At a recent half-day event in Shenzhen, China, BSR and Walmart highlighted program outcomes and led discussions about how brands and factories can invest in workers to help China become a manufacturing leader as the industry evolves in the future. When BSR Asia-Pacific Vice President Jeremy Prepscius opened the event, he described how brands’ perceptions of factory workers is shifting from a focus on identifying and managing risks to finding ways to add value. Previously, many factory managers didn’t understand the value of investing resources in workers and considered these efforts a waste. 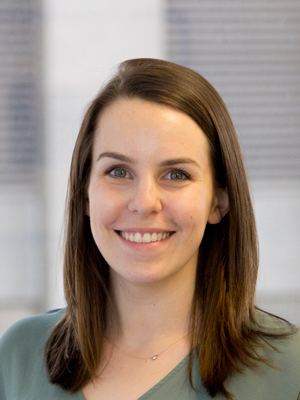 As the Women in Factories program progressed, however, more factories and companies began to see that investing in people can transform supply chains by building an internal pipeline of women leaders. Communication: 51 percent of participants significantly improved how they respond to disagreements at work, and 90 percent of workers showed improved communication skills. Commitment: 40 percent of participants showed an increased willingness to recommend their factories to others, indicating a better sense of ownership and a higher level of commitment to their work. One speaker from Hayco said that after the first wave of training, the company’s factories experienced a sharp decline in trainee turnover rates, from around 14 percent to 1 percent. Stress management: More than half of participants reported a significant improvement in their ability to manage stress, and 83 percent said they felt more capable at their jobs, which supports higher productivity. 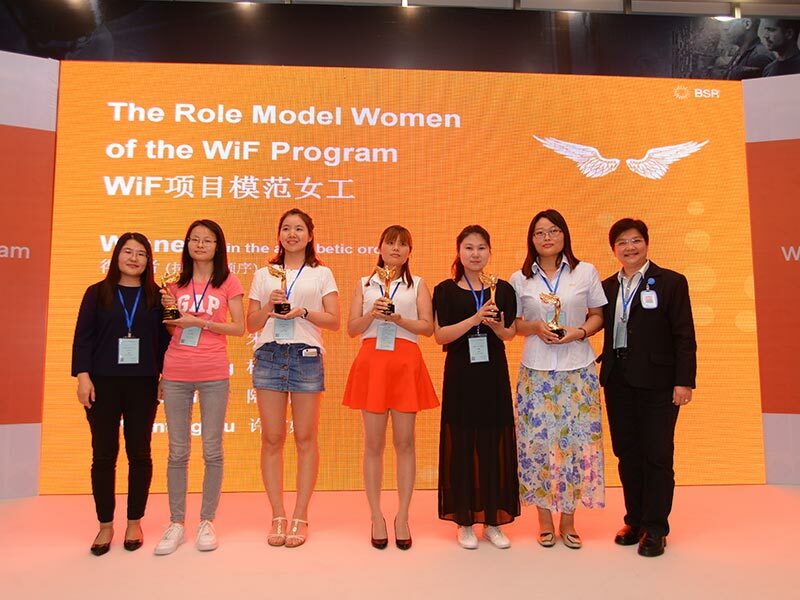 Lulu Zhu, a factory worker who received the program’s Role Model Women award, said she is now able to cope with conflicts. “Women in Factories enabled me to help my peers focus on the problem itself and find a solution rather than venting negative emotions,” she said. Professor Li Xiaoping of China Eastern Normal University, who analyzed more than 800,000 data points, said targeted training procedures, strong and interactive content, and timing were keys to the program’s success. 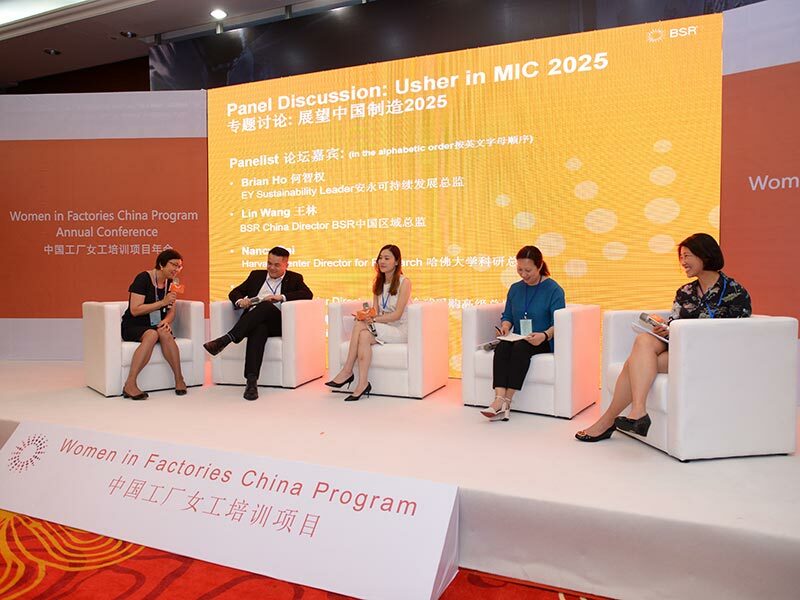 To close the event, BSR China Director Lin Wang moderated a panel on how industry trends are affecting factories and the labor force, and how investing in workers through the Made in China 2025 government initiative will help China become a manufacturing leader. Panelists included EY Sustainability Director Brian Ho, Harvard Center Shanghai Assistant Research Director Nancy Dai, Walmart Senior Sourcing Director Sophia Yu, and Foxconn Project Director Xuehu Xiong. China’s prevalent production and export business model is becoming a thing of the past. Today, the industry is poised to become more domestically self-sufficient, service-oriented, and competitive. This poses new challenges and opportunities for workers as more and more factories move toward automation. Panelists noted that while automation has the potential to threaten factory jobs, it also presents a massive opportunity for job creation. Future employers creating “smart factories” will need to teach new skills and nurture confidence because, even as production processes are streamlined, new jobs will require people to program and maintain machines and emerging technology. Yu said that the Women in Factories program has helped give thousands of women workers the confidence to learn new skills and pursue new opportunities in the workplace, which will support the transition for the jobs of the future. A Women in Factories impact report will be published later this year.